"I smell something burning. Oh wait! It's my career"! It's virtually a given that when a television show exceeds the expectations of its network and becomes water cooler conversational fodder, the competition will hurriedly carbon copy it in the hopes that lightning will strike twice. Most times, such pale imitations expire quicker than a parking meter with inadequate change. Occasionally though, a gem smart enough to offer more than slight variations on its original inspiration sets itself apart from the rest of the pack. One such show was The Mole, an ABC mid-season replacement from the winter of 2001. Ten players are brought together in a foreign locale to compete for a cash prize of a cool million bucks. Getting in their way? An obstacle...a single saboteur, or "mole." In every episode, contestants are put through challenges that not only test their physical stamina, but their mind as well. At the end of every installment, contestants are given a multi-question quiz. Those who do well play on, while the lowest scoring player is dismissed into obscurity (at least until the obligatory VH-1 Where Are They Now retrospective commences production). With its spy movie-esque locales, exciting pace, and excellent host in Anderson Cooper (now on CNN), The Mole established itself as the thinking man's (and woman's) reality alternative. Although ratings were far from Survivor-ish numbers, ABC thought enough of the show to give it a sophomore season, feeling it had a grower on its hands. Then came the tragic events of September 11, 2001. In the wake, all but the stalwarts of the reality genre took a hit. Unfortunately, Mole didn't fall into that category. After just two installments, ABC placed the series on a short hiatus that turned out to be more like a nine-month vacation, burning off the remaining episodes the following summer. Most assumed this was the end. But the alphabet network's feeble attempts at follow ups (John McEnroe's The Chair, All American Girl, and the ultimately sickening Are You Hot?—complete with laser pen wielding Lorenzo Lamas) sent an already troubled broadcast outlet's ratings spiraling further downward. So it was back to the semi-tried, semi-true, as ABC resurrected The Mole as a 2003 mid-season replacement. But wait, there was a twist this time (that's a big word in reality television nowadays). Instead of "average Joes" and "joe-ettes," we had the likes of Kim Coles, Stephen Baldwin, and supermodel Frederique Van Der Wal. Now, such a concept would have been kind of a fun alternative to summertime reruns, IF the network had re-launched the show as it once was. Give the common folk June thru August off and have the equivalent of Celebrity Jeopardy to keep the audience satisfied until the start of the regular season. But, uh-uh. Sneering like Mick Jagger on his best night, I initially wanted nothing to do with this overhaul. Watching Hollywood thespians on what amounted to a paid vacation in the guise of a show I once loved was sacrilegious. But midway through its run, I gave it a chance—and you know, it wasn't so bad. Really, take away the high priced cars, personal perks, and big fancy houses in the hills, and these folks are just as real as you and me. Wait a minute... did I just write that? Okay, maybe these folks are not the total equivalent of Scott and Laura next door, but the grueling physical contests and mentally challenging games that became the selling points of the series remained pretty much intact and not dumbed down like I thought they might be. As a bonus, the participants may have been actors, but that certainly didn't stop them from taking the concept seriously. Among Celebrity Mole's strongest assets are comedian Kathy Griffin (a huge fan of reality-themed programming herself) and former L.A. Law cast member Corbin Bernsen, the latter of whom takes so much in the way of notes, you'd think he was prepping for an investigative reporting gig (Woodward and Bernstein have nothing on this guy). Although I missed Anderson Cooper's superb hosting capabilities, which hit just the perfect notes for a show like this, veteran sportscaster Ahmad Rashad's laid back style provides a good contrast to the hyperactive goings-on. Although ratings lagged slightly behind the performance of the original series, the results were good enough demographically to earn a follow up season in 2004. Thanks to Eagle Vision's recent three-disc DVD release of the series, we have a chance to follow the show from beginning to end. And while I'm still a little peeved that ABC didn't try in the least to restore the show back to its former incarnation, I must admit I was entertained by this overhaul that, more often than not, recaptures the excitement, paranoia, and thrills that made it so much fun to watch in the first place. Among the high points are a bizarre scavenger-type quest pairing Van Der Wall, Erik Von Detten, and Griffin (the latter of whom brings the proceedings to an exciting climax), the challenge of a daring cliff jump, which makes former China Beach star Michael Boatman have second thoughts (in a rather touching sequence), a hilarious sheep-herding quest gathering the ensemble in matching button-up island-ready shirts (looking more like a reunion of former Up With People cast members) and an opening waterfall-based contest that gets the series off to an impressive start. Image Transfer Review: Since programs of this type are photographed in a variety of circumstances, even the best mastering techniques would be challenged to keep it all under the banner of consistency. But this transfer is just a couple of notches shy from perfection. Only an overly video look at times keeps it from top of the line achievement. Still, it's a cut above the recent re-airings on GSN (the re-christened Game Show Network). Audio Transfer Review: Extremely well mixed, this is one of the better Dolby Surround tracks I've heard on a television product in quite a while. It's spacious, and presents vibrantly sharp dialogue with both high and low ends perfectly in balance. Extras Review: Boasting more extras than some regular season television show collections can lay claim to, Celebrity Mole: Hawaii should serve as a prototype for future reality show compilations. Over an hour of deleted, alternate, and extended material is included on the dual-layered third disc: Suspicions is comprised of six cuts in which the players discuss various scenarios as to the identity of the saboteur. Deleted Scenes features eight clips of material, some of which were way too raw for commercial audiences, including an interesting conversation with Griffin and Von Detten, who reveals an interesting free-time fetish. Six Extended Scenes expand upon some of the show's most memorable moments highlighted by the group's uproarious, uncut reactions to Baldwin's drenching during the waterfall challenge, and a group confessional in which the cast reveal their most embarrassing moments (of which Boatman's is a classic). Funny Moments gathers a quartet of clips, including the endearing (or for some of you, horrifying) sight of watching leggy supermodel Frederique picking her nose; Post Execution Reactions and Interviews provides extended comments from the victims that were seriously snipped and censored on network showing, and Confessionals comprises those security camera-flavored, tongue-in-cheek moments in which the contestants reveal their innermost suspicions of who they think is the mole. In addition to the usual indexing of all of the material noted above, the makers of the set have provided the rather unusual option of a "Play All" function in which all the bonuses can be devoured in one sitting. Very nice. My only major peeve with this package is, well, the package. Whoever thought of the brilliant idea of trying to cram three DVDs into a Double Amaray case needs to have their entire collection repackaged into snappers; literally the dumbest idea since DIVX. 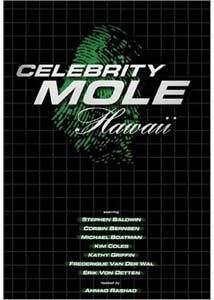 Although it doesn't hold a candle to its first two seasons with ordinary contestants, Celebrity Mole: Hawaii manages to capture most of the excitement, intrigue and just plain fun that made it so watchable in the first place. In addition to being surprisingly entertaining on a second go around, despite knowing the outcome, extensive extras make this a must-have for fans of the show and psuedo-reality television lovers.